Sudden aggression can indicate a medical condition in your kitty. If your formerly cuddly lap kitty has recently transformed into a ferocious feline with seemingly no explanation, something is most likely amiss with his health. Many medical conditions can cause sudden aggression and irritation in kitties, as can simply the pain of an injury or illness itself. A kitty's aggression, although appearing to come out of the blue, is never really without a reason. Several medical conditions can cause your usually mellow little one to suddenly become aggressive. The best way to determine if something could be bothering your kitty is to visit the vet so she can properly diagnose your furry friend through a physical exam, blood tests and any other necessary diagnostic tests she deems necessary, such as X-rays. Once properly diagnosed, your vet will give you medication to treat your kitty's condition or ease his pain, hopefully alleviating his aggression. She may also recommend a psychological medication to alter your furry buddy's foul mood in some cases. Hyperthyroidism, epilepsy and parasitic infections are all medical conditions that can result in sudden behavioral changes like aggression, according to the American Society for the Prevention of Cruelty to Animals. 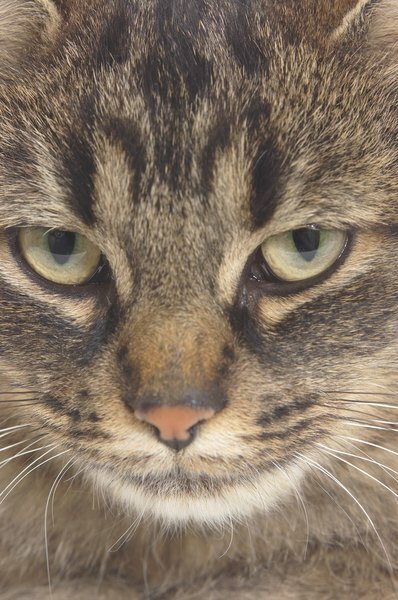 Painful conditions like dental disease, arthritis and dementia are also possible causes of aggression and increased irritability, especially in elderly felines. Trauma to your kitty can lead to broken bones or other bruises which cause him pain, and thus lead to a growl or bite when you touch him in a tender spot. If your furry friend is not spayed, it's possible she's either pregnant or in heat, both of which can lead to sudden bouts of hormonal, aggressive behavior. Mothers who have recently given birth to kittens may be protective of them and slightly aggressive toward you or other pets as well. Certain neurological conditions or bacterial and viral infections can affect your kitty's brain functions, leading to unpredictable, sudden bouts of aggression. Some of these conditions are treatable by your vet, while others may not be, such as rabies, which is very dangerous and communicable to people. If your furry friend has received a clean bill of health from your vet, something in his environment could be behind his sudden aggression. Many times your kitty may redirect his aggression toward you or another pet after being spooked by something as simple as seeing another feline outdoors. Close your blinds or curtains, especially on the windows your kitty likes to hang out by. Separate other pets from your kitty if he's been aggressive toward them and slowly reintroduce them to each other using treats as a reward for non-aggressive behavior. Use synthetic pheromone diffusers or sprays around your home to naturally calm your kitty, making him mellower and less prone to aggression. If changes to your kitty's environment don't seem to make any difference in your little one's bad attitude, you may need to consult with a certified animal behaviorist. She can give you tips on how to adjust your furry friend's behavior and can work with him one-on-one. An outside party may also be able to see something in your kitty's environment that you are missing, which could be spurring his aggressive behavior. Spay or neuter your furry friend if he's not already. When a cat reaches sexual maturity, hormones can lead to suddenly aggressive behavior in a previously playful kitten. 2ndchance.info: Dealing With Aggressive Behavior in Your Cat -- Why On Earth Does My Cat Bite & Scratch So!